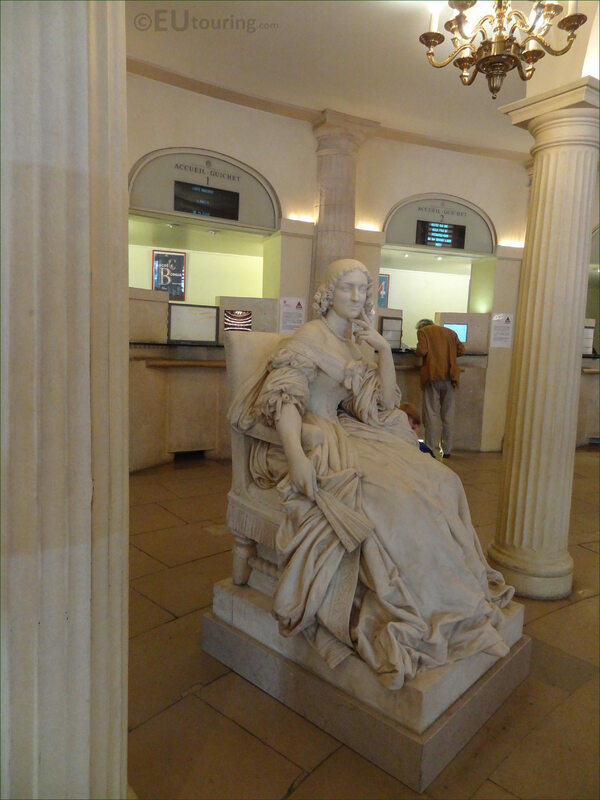 We were in the 1st Arrondissement of Paris at the Comedie Francaise, when we took these high definition photos showing a statue of Mademoiselle Mars, which was sculpted by Gabriel Jules Thomas. 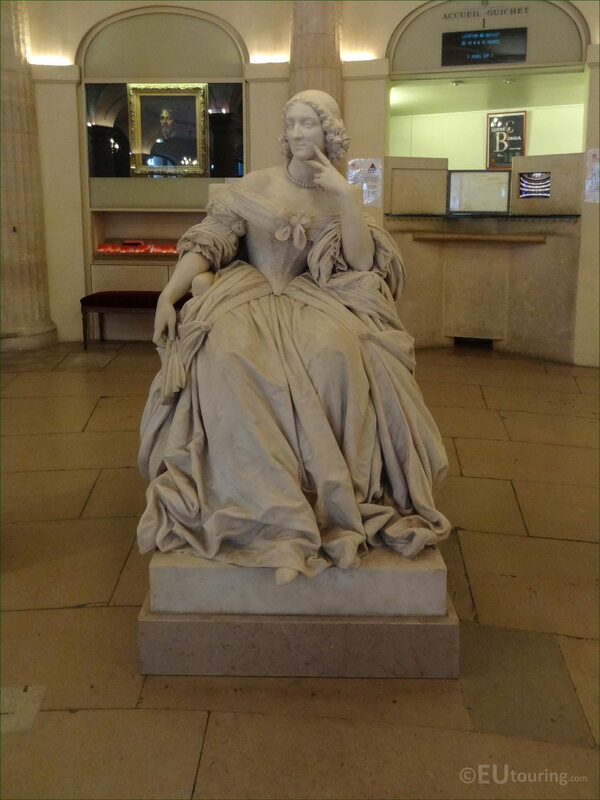 Located within the peristyle area of the Comedie Francaise, this first HD photo shows a statue that was sculpted in marble to depict an actress who performed at this French theatre and went by the name of Mlle Mars, or Mademoiselle Mars. 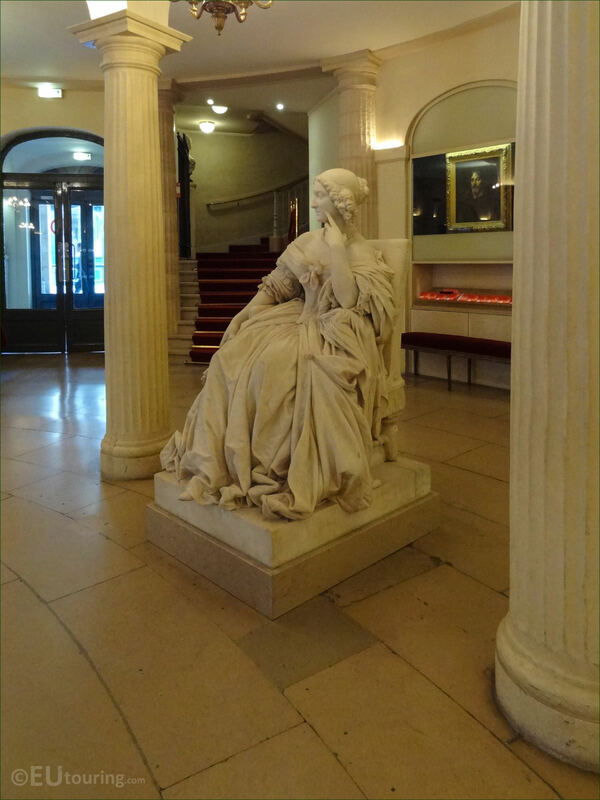 Mademoiselle Mars was born in Paris in 1779 with a name of Anne Francoise Hyppolyte Boutet Salvetat, with her father being an actor and author and her mother was also an actress that went by the name of Madame Mars, and gaining stage parts at a young age, her talents plus with her beauty she was soon commanding important roles and became known as Mademoiselle Mars. 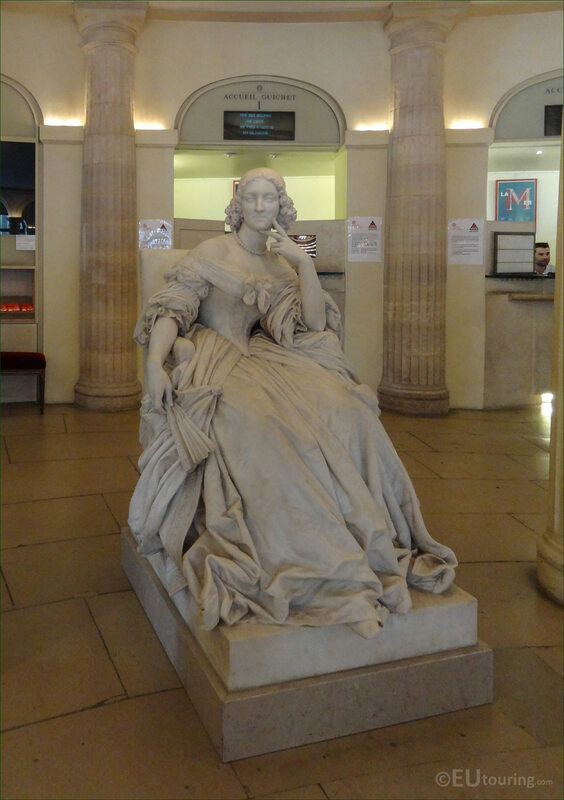 This particular statue of Mlle Mars was sculpted in marble to depict her wearing a costume that she used for the play Le Misanthrope, also referred to as the Cantankerous Lover, in which she played the lead female role of Celimine who was a young woman courted by other characters such as Alceste, which was a play written by Molliere, that survives as one of his best known works. 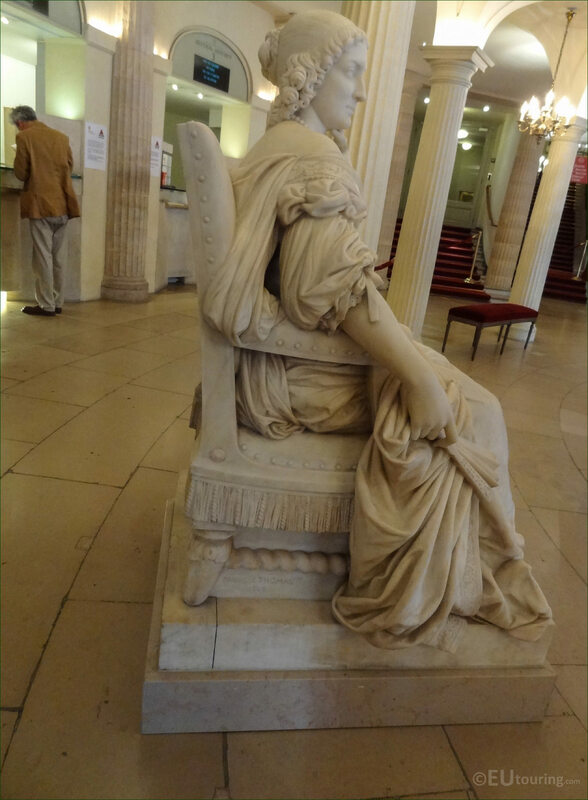 Mademoiselle Mars always used her own jewellery while on stage, however, as with most theatres many props were used including chairs, which is how she has been presented in this statue that can be seen within the peristyle of the Comedie Francaise, which is the central area of the state owned theatre building with its columns, as you can see in this image. 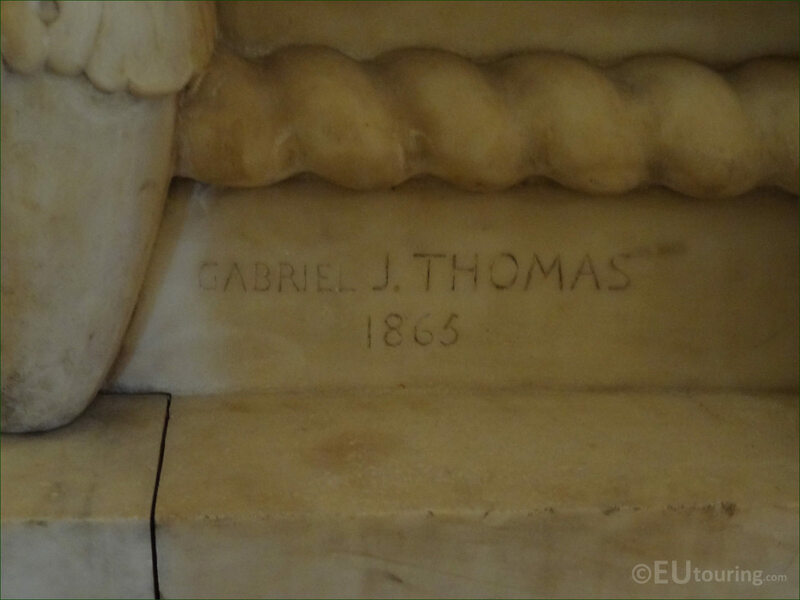 Here you can see a close up photograph we took showing where the artist Gabriel J Thomas has inscribed his name along with the date of 1865 on to the base of the statue, which is positioned to the left hand side of the statue as you are looking at it face on, or in other words, below the chair by the right arm of Mademoiselle Mars holding a fan and her gown. Gabriel Jules Thomas was born in Paris in 1824 and following his fathers footsteps he studied at the Ecole des Beaux Arts to become a French sculptor, winning the Prix de Rome in 1848, which led to numerous commissions throughout his career for tourist attractions such as the Palais Garnier Opera House, The Louvre, Gare du Nord and several churches like the Eglise Saint-Etienne-du-Mont. 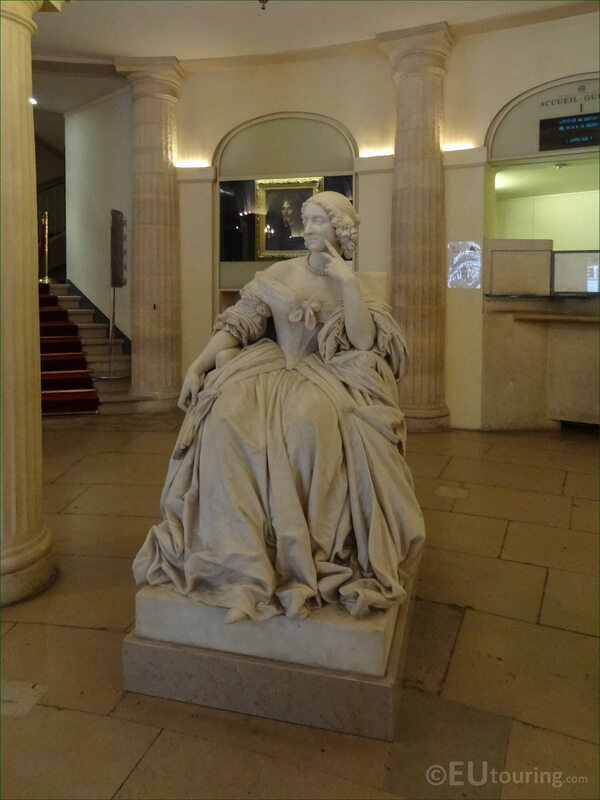 Now this particular statue by Gabriel Jules Thomas was initially produced in plaster, which is now held at the Musee des Beaux-Arts d'Angers, yet he then went on to produce the same statue in marble that you can see here, which was first presented at the 1865 Paris Salon under exhibit and catalogue number 3161 before it went to the Comedie Francaise. However, this has also been included in many exhibitions that have taken place since, including the Universal Exhibition of 1867, at the Grand Palais in 1986 and the Petit Palais in 2012. 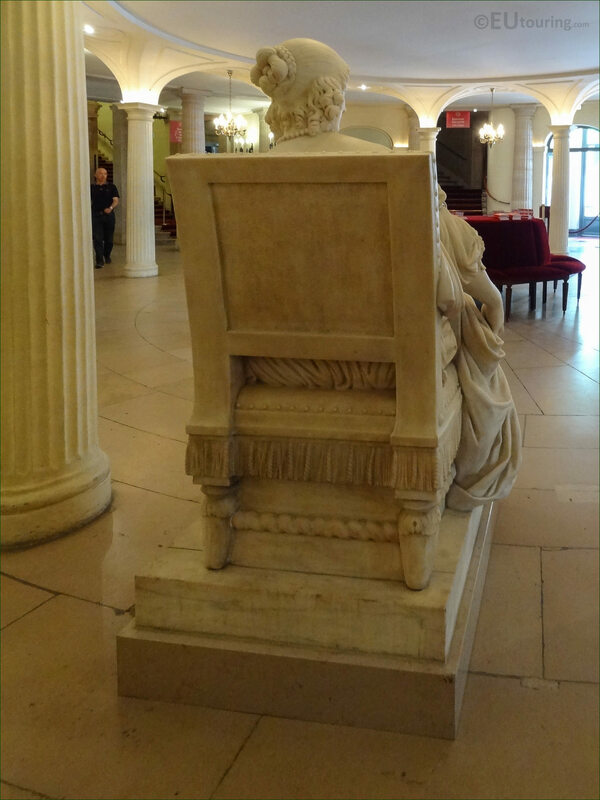 And this image shows the back of the statue dedicated to the actress Mademoiselle Mars, Anne Francoise Hyppolyte Boutet Salvetat, which we took looking into the peristyle section of the Comedie Francaise, also known as the Theatre Francais or the Theatre de la Republique, that is located at the Place Colette in the 1st Arrondissement of Paris, and is the only French state theatre to have its own troupe of actors, which has been the case since the late 1600s.